The food chain refers to a natural system by which energy is transmitted from one organism to another. When we refer to these systems on an ecological basis, we use the term food web. * The producers – these are the plants. They are called producers because they are the only part of the food chain that produces their own food, as well as the food for other organisms. In fact, the oxygen that all living things breathe in is a result of the food producing process of the plants (photosynthesis). The food that other organisms take in is also a result of the photosynthesis in plants that produces glucose. * The consumers – this refers to the group of organisms that eat something else. They may be herbivores (plant eating animals) or carnivores (flesh eating animals). They also include parasites and scavengers. * The fourth in the food chains are the scavengers. These are the fungi and bacteria that we look down on with such disgust. They are an all important part of the food chain because they convert all dead matter into nitrogen and carbon that is released into the atmosphere. Without the hard work put in by these scavengers the earth would just be one large garbage bin that was never emptied! 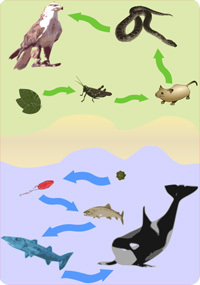 A food web on the other hand refers to a bunch of food chains that make up an ecosystem. It is a mass of connected food chains that are interlinked at various points. For instance, there may be links running between grass and all the animals that eat grass e.g. the goat, cow etc. Then there would be a link between those animals and other animals that ate them, for instance the lion, humans etc. A food chain describes a pattern through which energy is transmitted from the producers or the plants to the decomposers. For instance, it would perhaps describe how a tiny fish survive on plankton, while the larger ones survive on them. A food web on the other hand would also include the big fish that were feeding on the plankton as well. It basically depicts a broader picture of all interconnected food chains that exist within an ecosystem. A food chain is a description of a single link between the origin of the source of energy and its final recipient. A food web includes all such chains that make up an ecosystem. It can be described as a collection of individual and interlinked food chains! Both food chains and the food web have been adversely affected by the onslaught of human civilization. In order to make our habitat more ‘conducive’, we are causing the destruction of valuable parts of the food chain and the food web. For instance, the use of pesticides is having an adverse effect on most of the eco systems. Man must realize that they are a part of the food chain and that their welfare is dependent on others also! Purpa Mukherjee. "Difference Between the Food Chain and the Food Web." DifferenceBetween.net. September 18, 2009 < http://www.differencebetween.net/science/difference-between-the-food-chain-and-the-food-web/ >. This is not helpful. Nor truthful! wait huh? I was too bizzy finding good facts to listen!